The UAVSAR underbelly pod is in clear view as NASA's Gulfstream III research aircraft banks away over Edwards Air Force Base during aerodynamic clearance flights. As a Multi-Role Cooperative Research Platform, the heavily instrumented twin-turbofan aircraft provides long-term capability for efficient testing of subsonic flight experiments for NASA, the U.S. Air Force, other government agencies, academia, and private industry. Originally designated a C-20A by the Air Force, the aircraft was declared excess by that service and transferred to NASA Dryden at Edwards AFB, Calif., in September 2002. NASA hasdeveloped a way for an aircraft to repeat the same level flight path anywherein the world, after any time interval, to a constant positional accuracy within15 feet (5 meters) in any direction. Developmentof the highly accurate navigation technique was needed to allow NASA'sDryden Flight Research Center at Edwards, Calif. to use its C-20AGulfstream III as a flying testbed for a new, compact imaging radar pod thatuses a technique called repeat pass interferometry to produce highly detailedmicrowave images of the earth's surface. The radarpod, developed by NASA's Jet Propulsion Laboratory (JPL) in Pasadena, Calif., contains an L-Band synthetic aperture radar that uses microwaves in the 1.2 gigahertzrange to detect and measure small deformations in the Earth's surface that areof interest to scientific researchers. Such measurements include the movementsof glaciers, earthquake fault lines, landslides, and expansion of volcanoes. JPL hasdesigned the 10-foot-long pod so it can be mounted on a variety of aircraft.These will include unmanned aircraft which can loiter for long periods over areasof interest, or can fly particularly dangerous missions -- say, over thedomes of volcanoes expected to erupt imminently. That's why JPL has called theproject the Unmanned Aerial Vehicle Synthetic Aperture Radar (UAVSAR). As might beexpected, the new navigational technique -- developed by NASA Dryden incooperation with JPL -- makes use of Global Positioning System (GPS) signals. But wherethe Wide Area Augmentation System now entering service in the United States forcivilian aviation navigation provides positional correction vectors accurate towithin 30 feet, UAVSAR needs correctional vectors 30 to 50 times more accurate thanthis so its radar can be "steered" electronically to maintain therequisite millimeter-scale resolution. Anotherproblem with commercial GPS systems is that the NavCon satellites they use onlyprovide signal coverage to 75 degrees latitude in both the northern andsouthern hemispheres, said Scott Hensley, chief scientist for the UAVSARprogram. But UAVSARwill be used to measure the movements of glaciers in Greenland and Antarctica, located at latitudes greater than 75 degrees. So JPL has developed a way tosend real-time GPS correction vectors via Iridium satellite phone circuits,allowing coverage over the entire globe. To achieve therequired navigational accuracy, the real-time GPS signal that the UAVSAR podreceives is fed to the Gulfstream III's flight management computers. There, in anew system developed by NASADryden and called the Platform Precision Autopilot (PPA), it is combined with40-times-a-second inputs from the aircraft's laser gyro-driven inertialnavigation unit (INU) to produce very accurate positional and guidanceinformation, explained James Lee, NASA's principal investigator for thePlatform Precision Autopilot. When fedthrough the aircraft's navigation receiver to its flight director, the combinedGPS and INU signals show positional and guidance information as an instrumentlanding system (ILS) approach-mode display, familiar to instrument-ratedpilots. The ILS display shows a cross-track localizer vector to provide lateralguidance and a glideslope vector to provide vertical guidance. By havingthe PPA provide ILS signals through the flight director, NASA Dryden hasensured that the Gulfstream III's modified navigational system remainsFAA-certified as being safe for flight. Additionally,said Lee, Dryden's pilots know the pitch-angle, roll-angle, and yaw-anglelimits programmed into the Gulfstream III's flight director. "So even ifour (PPA) system is shut off, we know what the aircraft will do" in termsof its handling characteristics, he said. To makethings simpler, JPL chose to have UAVSAR's 1.5 meter-by-0.5 meter radar antennasteered electronically -- that is, a microprocessor modifies its radar signalto compensate for changes in the carrying aircraft's attitude -- rather thanmechanically, said Hensley. Had JPLchosen to steer the antenna mechanically, the steering system would have to bemodified every time the UAVSAR pod was fitted to a different aircraft. But withelectronic steering the pod can be transferred from aircraft to aircraftwithout modification. To ensurethe accuracy of the electronic steering system and the radar's imagingresolution, JPL also has given the UAVSAR pod an inertial navigation system,which works in conjunction with its real-time GPS input to produce positionalfixes accurate to within 10 to 20 centimeters. 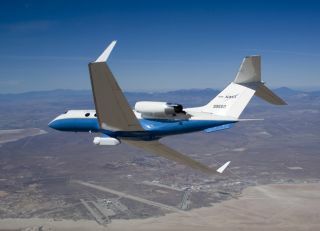 The 19 testflights that NASA Dryden has performed so far with the PPA-equipped GulfstreamIII/UAVSAR combination have proved that more than 90 percent of the time theaircraft can repeat exactly the same level, great-circle flight path within a 15-footradius. Effectively it follows a 10-meter-diameter tube in the sky. "Thatwas our requirement," said Lee. However, the "contour plots"that Dryden has developed of the aircraft's exact position during each repeatpass show that 20 to 30 percent of the time the Gulfstream III stays within 3feet (1 meter) of the center of its flight path in the previous pass. NASA Drydenand JPL will conduct another 140 hours of flying before UAVSAR flight-testingfinishes at the end of August 2008. But Hensley said the pod will remain on theNASA Gulfstream III for the foreseeable future. The reason forthis is that obtaining FAA permission for a UAV to operate in U.S. civilian airspace normally requires filing a flightplan 90 days in advance. Flying the manned Gulfstream III requires no suchnotice. "Ifthere's an earthquake, we want to be up in the air quickly," said Hensley.The 90-day UAV advance-filing period "can change, but right now thelogistics in the NAS (U.S. National Airspace System) are simpler with aconventional aircraft." Satellites usuallyprovide more suitable mounts for SAR sensors than do aircraft, because they areunaffected by air movement and their orbits are much more predictable navigationallythan aircraft flight paths. However, SAR satellites only overfly the samelocation once every 24 to 45 days. "Theprocesses we're watching happen at timescales less than 30 days," saidHensley. By mounting UAVSAR on an aircraft, "we can control repeat timefrom hours to years."